Eighteen years ago I got a visit from a man that had a small recording studio. Herman Brood made his demo’s there. That day, or actually the night before that day, this guy and some of his friends had come up with a brilliant plan. The Berlin Wall had just been taken down and they were making a record about it!!! It was a cover of Otis Redding’s ”Sittin’ on the dock of the bay” , with new lyrics. I didn’t like the plan; cashing in on important events is not really what interests me. But they needed a sleeve for the record; the record would be recorded that night and the 45 should be pressed the next day. Another reason why I didn’t like this project. 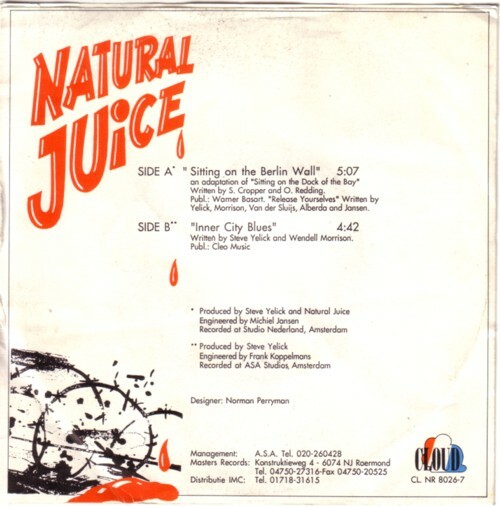 But because I liked the man, and because he had helped me out too sometimes, I made a drawing for the cover and a logo for the band, Natural Juice. Not that there was a band; it was just a singer with some studio musicians. I didn’t get paid; if the record would be a hit, I would get my money. Yeah! A few weeks later I asked what happened to the record. The man told me that everything had gone wrong and that there was no record. Ofcourse, I didn’t get my artwork back. So far, end of this story. 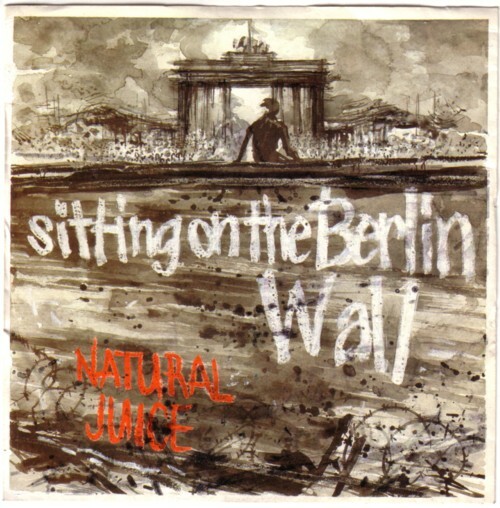 But this afternoon I went through some boxes with second hand records and to my surprise I found a 45 from Natural Juice, ”Sittin’on the Berlin wall” ! The record had another sleeve than the one I did, but they had used my logo on the back. Not as I had made it (black outline, red inline), but in one colour (red). I tried to find photocopies of my artwork, because I am sure I kept that, but I couldn´t find it. It was fun to hear this non/existing record after 18 years. The singer is Wendell Morrison. I remember him, he came to pick up the artwork later that evening. I cannot remember how I felt about this project back then. Many projects ended this way, and I guess I never expected much of it from the beginning. But I sure am happy to finally have the record! Here is the B/side, ”Inner city blues” .